Holiday celebrations serve as a great excuse for companies to connect employees, consumers and executives under one communal event. Not all individuals recognize the same holidays, but businesses can combat this by creating their own event for everyone to enjoy. March 26 marks this year’s Make Up Your Own Holiday Day, which serves as the perfect time during which companies can revel in the joy of whatever they wish. Creating your own celebration allows executives the opportunity to hold a variety of engaging activities or office celebrations. After the office picks its theme, companies can promote the new holiday on social networks, websites, fliers and through word-of-mouth promotion. Whether they choose to have a community-wide event or more personal party, businesses should take advantage of this fun day. The joy of made-up holidays is that they can celebrate any little or big thing the company desires. 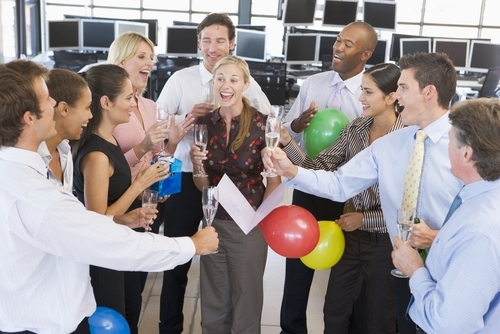 Whether they choose to honor an achievement made by employees or to lift up the mundane, these celebrations can allow employees to take a break from their everyday lives and revel in the excitement of their own holiday. Education World reported that made-up events have the potential to engage groups of people, allowing them to unite under one fun theme, which doesn’t necessarily have to be anything special. For example, the source describes National Mustard Day, a holiday that celebrates the universality of the condiment. Similar to most new trends introduced to the public, some holidays stick around and garner a large amount of press, while others sizzle out and are seldom heard of again. CNN recently chronicled the process of creating one’s own holiday, including the process individuals should follow and the forms he or she must fill out. One man, Thomas Roy, told the source that he had created more than 90 holidays within the past 26 years, some of which have received an impressive amount of attention. Some of his events include No Socks Day, Married to a Scorpio Support Day and Northern Hemisphere Hoodie-Hoo Day, or a day in which people are encouraged to go outside at noon and shout “Hoodie Hoo.” Roy explained that he initially submitted the event as a joke to Chase’s Calendar of Events, but – much to his surprise – it was accepted and printed in subsequent editions. “Some silly … thing that came out of my own head caused who knows how many people to have mirth for a day,” Roy said. Another popular event followed by CNN was Left-Handers’ Day, where people honor individuals who are left-handed and operate using their own south paw. Keith Milsom, the inventor of the holiday, told the source that people constantly contact him to let him know about their celebrations. Inventing a new holiday can reap a number of rewards for holidays, ranging from providing an opportunity for consumers to gather and receive information pertaining to the brand, to giving employees an excuse to have even more fun in the workplace. Businesses that hold events to celebrate can distribute promotional products that relate to the holiday, whether their event lends itself to personalized calendars or mugs. These celebrations provide a perfect opportunity for companies to engage the public through contests or promo giveaways. Additionally, businesses that create a holiday that is innovative enough to garner public attraction may see great returns, either through media attention or the universal adoption of their event.